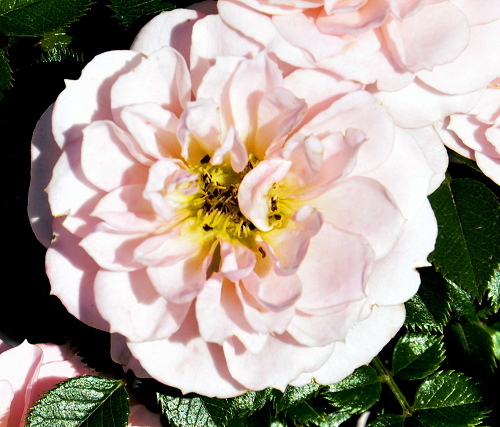 Baby Austin is a sometimes referred to as a micro-mini rose because its pale pink petals and leaves are tiny. Each bud is the size of a dime that opens to a nickel size rose. The plant grows to about a foot and half tall. It is a prolific bloomer and quite a show stopper. Because of its diminutive size, it makes a good choice for container growing. Start by placing our three inch pot into a container that will hold about a gallon of potting soil. Potting soil should have a coarse texture and have organic granular fertilizer mixed in before planting. Check the container each year to make sure the rose is not root bound. If it has filled up the container with roots, transplant to a gallon size larger container.